Back in December, we first reported on a device called the HTC Fireball that was headed to Verizon as one of their next 4G LTE devices. Details were scarce and we have yet to see much pertaining to it leak out since then. There were pictures of a device that looked a lot like a slightly beefed up Incredible 2 with a Big Red LTE logo that could very well be it, but no confirmations yet. 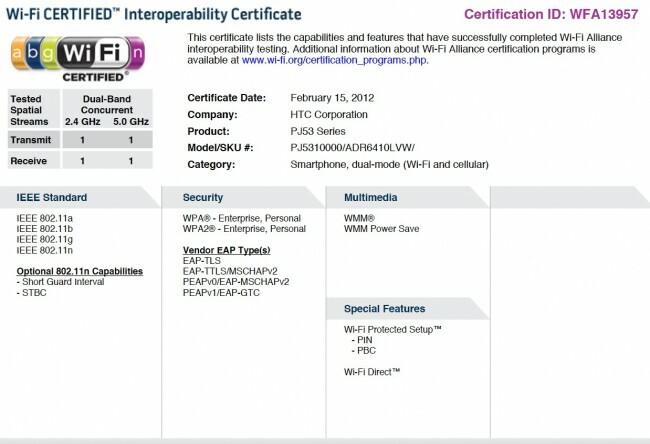 One thing we do have no though, that will add to the story is a WiFi certification for the device. As you can see from the screenshot, the model number ADR6410LVW is included, which is the same number we first posted a few months back. That “VW” on the end of the name also likely stands for Verizon Wireless in case you were wondering. So the device is still in the works, but with it now starting to receive certifications, you have to imagine that HTC and Verizon are making last minute pushes to get it a release.